Hypertension (HTN) or high blood pressure, sometimes called arterial hypertension, is a chronic medical condition in which the blood pressure in the arteries is elevated. High blood pressure usually causes no symptoms and high blood pressure often is labeled “the silent killer.” People who have high blood pressure typically don’t know it until their blood pressure is measured. Normal blood pressure of a fit person is 120/80. If this reading goes above 140/90, then you should consider yourself as a hypertensive patient. Between 120 and 140 is a pre hypertensive stage which can be controlled even by natural measures like exercise, low intake of salt, avoidance of smoking, maintaining lower levels of cholesterol and by consuming fresh fruits and vegetables. With many people,high blood pressure takes several years for indications of the disease to become noticeable. In those cases where high blood pressure signs and symptoms are evident, people may experience headaches, blurred vision, nausea, or dizziness. People often do not seek medical care until they have symptoms arising from the organ damage caused by long-term (ongoing, chronic) high blood pressure. The long-term high blood pressure affects most include: blood vessels, heart, kidneys, eyes, brain. If you do not have the above symptoms, it does not mean that you have no high blood pressure at all. Remember that the most common symptom of high Blood pressure is that “It Has No Symptom”. The best way to maintain your health and prevent this disorder is to have your blood pressure checked at frequent intervals. Everyone 18 years and older should have their blood pressure measured on a regular basis. Such recommendations are especially important for individuals who have prehypertension or hypertension, a family history of hypertension, are overweight, or are over age 40. 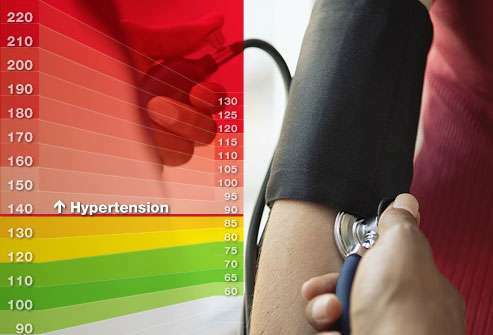 In rare cases (fewer than 1% of all patients with hypertension), the blood pressure rises quickly (with diastolic pressure usually rising to 130 mm Hg or higher), resulting in malignant or accelerated hypertension. Malignant hypertension requires emergency intervention and lowering of blood pressure to prevent brain hemorrhage or stroke. People should call a doctor immediately if these symptoms occur: drowsiness, confusion, headache, nausea, loss of vision, respiratory distress (difficulty breathing). Click here to learn the healthy lifestyles and home remedies for high blood pressure.